" So...what about coffee? Is it good or bad?" This is probably one of the most common questions I get asked from clients, students, and friends. If you are one of the 250 million Americans who consume coffee regularly, you may be wondering the same thing (and crossing fingers that my opinion supports your mild addiction).Here's my honest take on coffee: as with many foods, there is no clean cut answer. There are many factors to consider that determine whether it's a good addition to your diet/lifestyle or not. Let me give you the good, the bad, my personal experience, and the same advice I give to my clients. From there, you can be the judge. The caffeine in coffee can help boost energy and productivity. It has also been shown to increase mood and help alleviate depression. Caffeine can increase physical performance and allow you to gain more from your workouts. Some studies also suggest that it helps break down fat cells to be used as energy. Therefore, a cup of joe 30 minutes before training can help burn fat and increase performance. Coffee is acid-forming in the body. All of our body’s tissues and organs (except the stomach) like to be at a nice alkaline pH to function optimally. Caffeine creates a stress response in the body, stimulating the release of epinephrine (adrenaline) and cortisol. When the body is in a constant state of “fight or flight”, especially at rest, we are causing some serious wear and tear on the adrenals. This increase in cortisol also elevates blood sugar levels, which contributes to insulin resistance, mood and energy swings, and excess fat storage. Even if consumed early in the day, caffeine can disrupt sleep patterns. Digestion: this caffeine-induced stress response impairs digestion and nutrient absorption by diverting blood away from the digestive system. It also may impair the absorption of key minerals such as magnesium, iron, calcium, and zinc. Personal Experience: I love coffee. Love the taste, love the smell, love the buzz. In fact, I'm sipping on a 1/2 decaf americano as I write this. I especially love the kick before a hard workout or a long run/hike. But I also know that when I've been off it for at least a week I sleep better and both my energy and mood are more stable throughout the day. The biggest impact I feel personally is digestion. Caffeine seems to dampen my hunger/satiety signals. Intuitive eating (eating when hungry and stopping when full) is a huge factor in how I approach my daily diet, and I don't like when I feel out of tune with this. I'd love to say that I can avoid the stuff completely, but I do indulge here and there. I just have to weigh if the consequences are worth it for that day. If you just have to have it: believe me, I get it. Whether you have a deep romance with your french press or you're in desperate need of a pick-me-up, sometimes you just want some coffee. Here are some ways to help minimize any negative affects it may have on your body. Consider the quality of your coffee. Try to find an organic brand that you can brew at home, or a local coffee shop that uses organic beans. If you can, always get the real stuff as opposed to instant coffee. Be aware of what you're putting in your joe. Adding loads of refined sugars, syrups, and cream is going to add even more harmful stress on your body. Aim to reduce these additives, or opt for more natural flavorings like honey, maple, organic milk, or a non-dairy alternative such as coconut or almond milk. Cinnamon and raw cacao powder are a couple other delicious and health-promoting options. Timing: when you have your coffee matters. Have your coffee early in the day (before noon), to avoid possible sleep disruption. Also consider what you will be doing in the hours following consumption. Try to avoid it when you know you will be fairly inactive. Again- caffeine produces a stress response in the body, and those stress hormones can be better metabolized if you get your body moving. Summary: Still not sure? 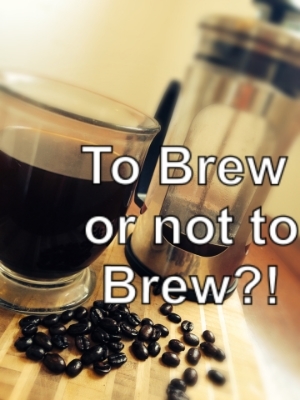 Here's what I tell people when they ask me if they "should" drink coffee. For healthy individuals, coffee in moderation (less than 2 cups daily) is probably no big deal. For people who are dealing with adrenal fatigue, chronic stress, anxiety, excess weight, sleep issues, digestive issues, or aiming to detox- I'd say you're best without it. It doesn't mean you have to give it up forever, but at least until your endocrine system, metabolism, and digestion are functioning optimally. Lastly, never discount your personal experience, as your body is the best health coach you have! Note how you feel (energy, mood, sleep, physical performance, digestion, etc) when you've gone at least two weeks without coffee. Note the same when you're having the stuff regularly. Bauman, E., Friedlander, J. (2011). Therapeutic Nutrition. Penngrove, CA: Bauman College. "Coffee, Brewed from Grounds, Prepared with Tap Water." SELF NutritionData. SELF NutritionData, 2014. Web. 18 Feb. 2015. <http%3A%2F%2Fnutritiondata.self.com%2Ffacts%2Fbeverages%2F3898%2F2>. Walsh, Bryan. "Coffee and Hormones." Precision Nutrition. Precision Nutrition, 26 Jan. 2010. Web. 18 Feb. 2015. <http://www.precisionnutrition.com/coffee-and-hormones>. Learn the skills you need to lose weight, increase energy, and enjoy lifelong health and vitality. Apply for online coaching today!